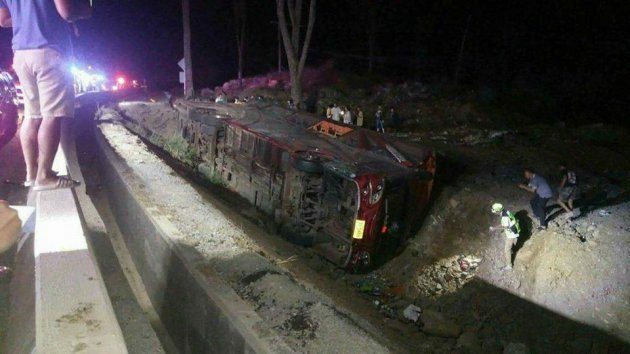 Seven Burmese migrant workers were killed and many have been injured after a bus carrying 50 Burmese migrant workers crashed in Tak Province in Thailand on Monday night (April 9). Under the arrangement of Gold Royal Mandalay Agency, a busload of 50 Burmese migrant workers were travelling from Mae Sot to Bangkok to work officially under the memorandum of understanding (MOU) system when the bus crashed on Doi Ruak hill in Tak Province, according to the Joint Action Committee for Burma Affairs (JACBA)’s chair U Moe Gyo. “Myawaddy District Administrator U Htoo Lwin and his team are going there now. Most of the buses [involved in accidents] run on natural gas. The bus crashed into a ditch. According to latest update, seven people died and 28 people have been injured,” he told Karen News. The injured people have been taken to the nearest hospitals and seven people have died so far and some of the seriously injured people may die, he added. A similar traffic accident took place on the Asia Highway in Wang Chao District of Tak Province on Monday morning after a public van carrying 14 Burmese migrant workers caught fire after a tire burst. The passengers narrowly escaped death as they were able to leave the van in time. Twenty out of 47 Burmese migrant workers died on the spot after their bus caught fire near the National Park in Tak Province on March 30. The migrant workers were on their way to work in Bangkok under the MOU system. Although Burma has provided compassionate money for the fire victims, Thailand still has not given any compensation, according to labor rights activists. Traffic deaths and injuries have been rising among Burmese migrant workers travelling from Mae Sot to work inside Thailand under the MOU system within this year, according to Burma labor rights activists.